You might miss some summer days working, but that&apos;s why we have summer nights! Get out and play! Well its the middle of July and people are making all kinds of plans to enjoy these warm sunny summer days while they last. The problem is, unless you&apos;re independently wealthy, or maybe a school teacher, a lot of the great weather is going on while you&apos;re inside at work! I know how that goes. Sure its summer, but it may as well be February if you&apos;re inside, and in your office working. Don&apos;t fret. As stressful as that sounds, like you&apos;re missing the party or something, one of the great things about summer is the daylight filled evenings and friendly temps that often make an evening outing a bit cooler and more pleasurable. While we&apos;ve still got a good amount of summer left, do yourself, (and your favorite person or group to hang out with), a favor and get out to a few of Greater Lansing&apos;s hot summer fun spots for a evening that feels like a mini, three-hour vacation. 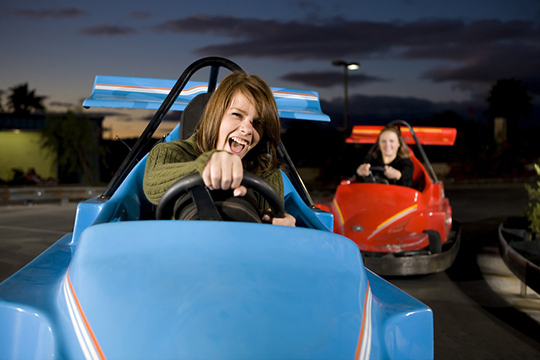 The FunTyme Adventure Parks in the area, one in Okemos and one in Grand Ledge, are an awesome way to get your summer fun in during the evening, even though you worked all day. From mini-golf to the batting cages and driving ranges and go-karts, there are a bunch of ways to move your body, have some fun, and engage a little friendly competition. Then cool off inside with a pop or a snack and play some video games and, even better, cool skill games like skee-ball and pop-a-shot. It&apos;s not very expensive and its a great way to be out in these fabulous summer evenings we have to enjoy for another eight weeks or so. If you have a day to spend though, or even a few hours of a day, you&apos;ve got to check out the East Lansing Family Aquatic Center. This fun and family-friendly water park offers a 200-foot tube slide, 120-foot body slide, 15-foot drop slide, diving board, zero-depth leisure pool with youth frog slide and interactive water play structures, wet/dry sand play area, sunbathing deck, changing rooms, concession and a picnic area. If you&apos;ve been before, but not in a season or two, its time to go back to see the new 3,000 square foot splash pad! Yes we all look forward to summer, but none of us get to soak up the sunshine-filled days all summer long. Yes, you sometimes have to work when its nice outside, but make use of your evenings and weekends. You&apos;ll be sporting a smile and a sun-burn in no time. Have fun!